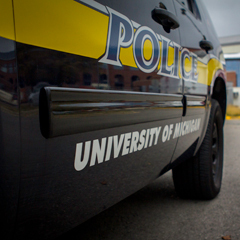 As your student packs up for Thanksgiving or winter break, encourage them to think about how to safely secure their residence before they leave Ann Arbor. Remind your student to leave the heat on around 55 degrees in their apartments or home. Some students want to turn their heat off to keep costs down which is problematic in Michigan. If the temperature drops too low, they may return to frozen or cracked water pipes. Students may request to have their mail held through the United States Post Office. Piled up mail or boxes on the porch for significant periods of time can be a sign that no one is home. Leaving a light on or connecting a lamp to a timer can make the house look like someone is home, which could deter breaking and entering. The last person to leave can unplug appliances or electronics that won't be used during the break. Encourage your student to connect with a trusted neighbor who will be home while they are gone to check the property. If the landlord lives locally, they may also be able to check on the house or apartment. Students should close their curtains and blinds so that the inside of their property is not visible. Encourage your student to keep valuables hidden and out of sight when they are not home. Remind your student to park their vehicle only in permitted spaces and to remove any personal belongings from their car. These are all tips your student should consider before leaving for break. If your student will stay in Ann Arbor during breaks, encourage them to be a good neighbor and if they see something, they should say something! You can keep up on safety and crime alerts near your student’s off-campus home by subscribing to crimemapping.com. Read more about safety on the Division of Public Safety and Security website.